Artichokes are one of the tastiest food known to man when cooked correctly. It would be my pleasure to teach you how to cook artichokes to perfection. Begin by rinsing the artichoke in cold water and using kitchen scissors to clip the end point off of each leaf. Place the artichokes into a pan of cold, lightly salted water deep enough to cover the whole artichoke. Place over medium heat on the stove and let cook. Bring to a boil and let cook for ten minutes. Check the artichoke by pulling off one leaf and checking just the end meat of the leaf for softness. If it is soft to the teeth then it is ready. 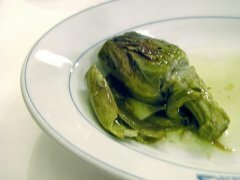 Artichokes can take up to one hour to cook depending on how many you have in the pot and how much water you are using. Drain the artichokes and serve with a melted butter dip or mayonnaise. Dip the end of each leaf in your sauce and pull the end meat off with your teeth. This is the only part you will eat from each leaf. Artichokes are an extremely healthy vegetable, containing such nutrients as fiber, iron, potassium, and calcium.